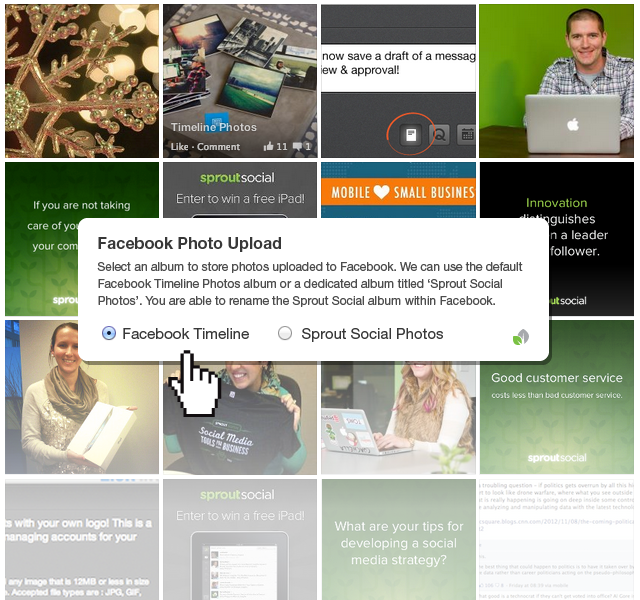 We have added a new option for Facebook photo uploads through Sprout Social. You can now post photos directly to your Facebook Timeline album. This is a subtle change that gets us one step closer to matching the native Facebook functionality. Selecting Facebook Timeline will store images in the generic Facebook Timeline album that is already used when attaching an image as a Facebook post. Account owners can go to “Business Settings” and select “Facebook Timeline” to use this album for all of your Facebook profiles. Selecting “Sprout Social Photos” will still post the image on your Timeline, but will also store them in a dedicated photo album titled “Sprout Social Photos.” You can rename this album by visiting Facebook. We understand that it is the little things that make a big difference. Thanks for the feedback.